Before you deploy Networking, it is useful to understand the Networking services and how they interact with the OpenStack components. Networking is a standalone component in the OpenStack modular architecture. It is positioned alongside OpenStack components such as Compute, Image service, Identity, or Dashboard. Like those components, a deployment of Networking often involves deploying several services to a variety of hosts. The Networking server uses the neutron-server daemon to expose the Networking API and enable administration of the configured Networking plug-in. Typically, the plug-in requires access to a database for persistent storage (also similar to other OpenStack services). plug-in agent (neutron-*-agent) Runs on each hypervisor to perform local vSwitch configuration. The agent that runs, depends on the plug-in that you use. Certain plug-ins do not require an agent. dhcp agent (neutron-dhcp-agent) Provides DHCP services to project networks. Required by certain plug-ins. l3 agent (neutron-l3-agent) Provides L3/NAT forwarding to provide external network access for VMs on project networks. Required by certain plug-ins. metering agent (neutron-metering-agent) Provides L3 traffic metering for project networks. Networking relies on the Identity service (keystone) for the authentication and authorization of all API requests. Compute (nova) interacts with Networking through calls to its standard API. As part of creating a VM, the nova-compute service communicates with the Networking API to plug each virtual NIC on the VM into a particular network. The dashboard (horizon) integrates with the Networking API, enabling administrators and project users to create and manage network services through a web-based GUI. 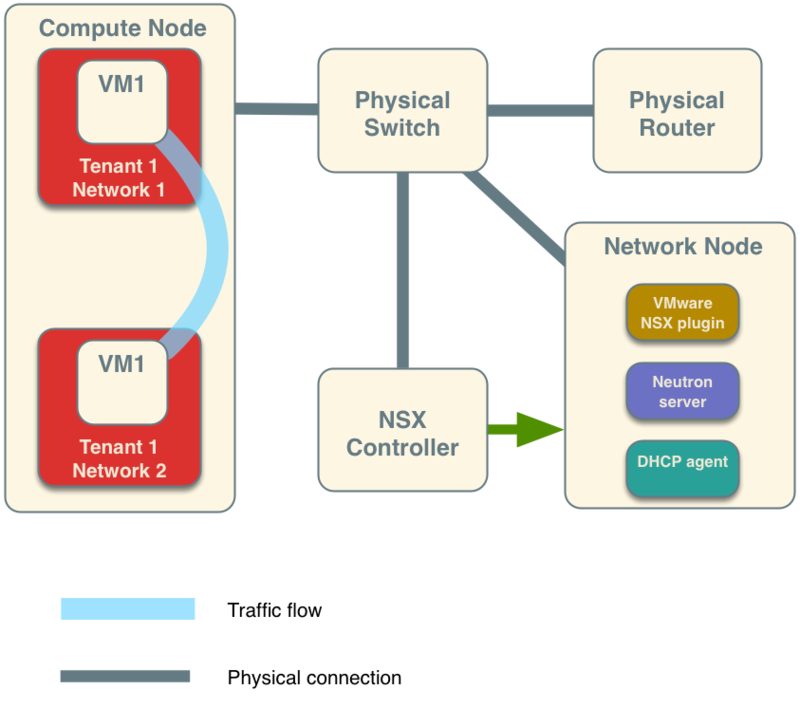 OpenStack Networking uses the NSX plug-in to integrate with an existing VMware vCenter deployment. When installed on the network nodes, the NSX plug-in enables a NSX controller to centrally manage configuration settings and push them to managed network nodes. Network nodes are considered managed when they are added as hypervisors to the NSX controller. 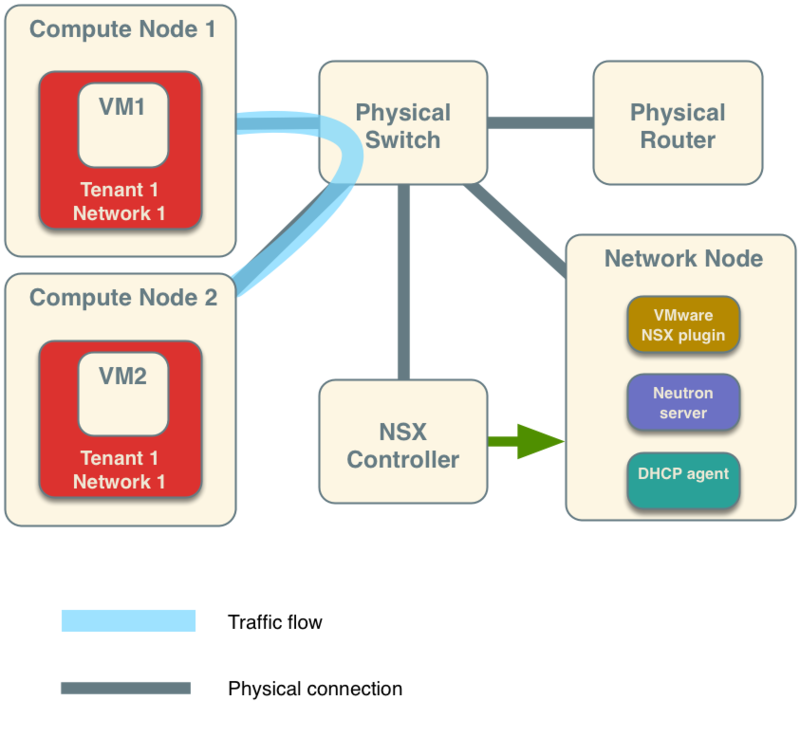 The diagrams below depict some VMware NSX deployment examples. The first diagram illustrates the traffic flow between VMs on separate Compute nodes, and the second diagram between two VMs on a single compute node. Note the placement of the VMware NSX plug-in and the neutron-server service on the network node. The green arrow indicates the management relationship between the NSX controller and the network node.